Plans for a federal highway system were already underway by 1944, but not until 1956 and the passage of the Federal Highway Act did they receive adequate political support and funding to materialize. Cold War fears then legitimized spending money on highways that would efficiently transport military personnel and equipment in case of an attack by the Soviet Union. In early 1956, alarmed Cleveland Heights residents first got wind of plans for a federal highway that would run from Euclid Avenue through the Forest Hill development and east to South Euclid, Lyndhurst, and Highland Heights. They were reassured that this "Heights Freeway" was 25 years away. In December 1963, however, County Engineer Albert Porter made public his proposals for the Clark Freeway (I-290) that would run east and west along the Shaker Lakes to I-271 in Pepper Pike, with a north-south interchange at Lee. The "Sun Press" immediately reported that the eight-lane highway would eliminate 80 homes and five commercial properties in Shaker Heights. Despite assurances that the freeway was in the distant future, Shaker Heights residents, led by Mayor Paul K. Jones, mobilized immediately in opposition to what they interpreted as a reckless destruction of fine homes and priceless parkland. 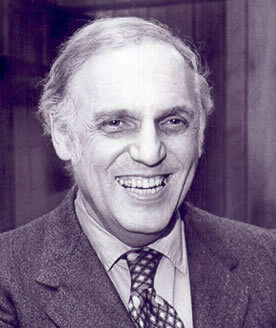 In response to 1962 federal legislation, the Cleveland/Seven County Transportation/Land Use Study (SCOTS) was established in 1963 and an early task was to assess Porter's proposal. At this stage, Shaker Heights officials and residents played key roles in opposing this imminent freeway since it posed the most threat to their suburb. Cleveland Heights officials followed Shaker's lead. 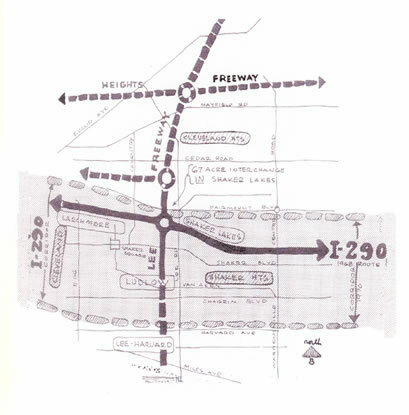 In 1963, County Engineer's maps showed Cleveland Heights would be on the paths of three future freeways: the Heights Freeway through East Cleveland, Cleveland Heights, South Euclid, and Lyndhurst; the Central Freeway along Cedar through the center of Cleveland Heights, and the north-south Lee Freeway that would connect the proposed Clark Freeway to Interstate 90. The Clark Freeway would also endanger Cleveland Heights since the northern boundaries of the Shaker Lakes are in Cleveland Heights, and the freeway would take some homes on North Park Boulevard. 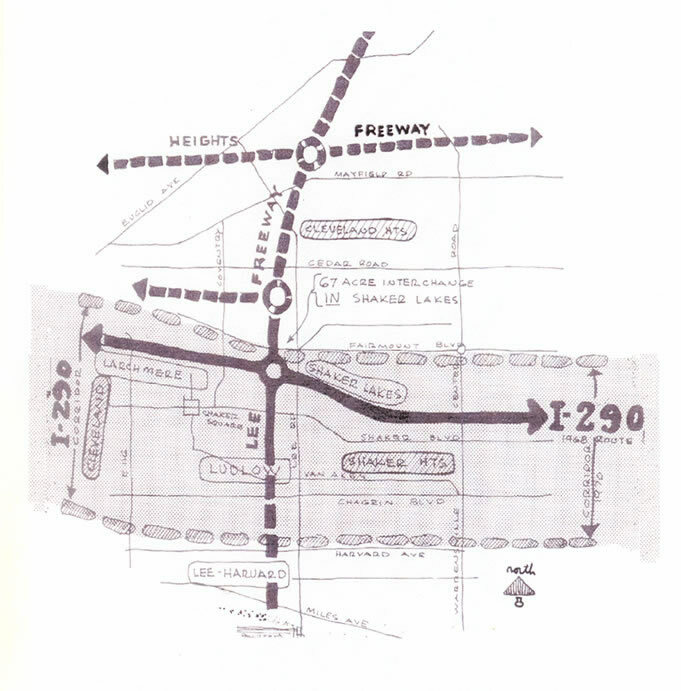 In January and February 1964, Mayor Kenneth Nash pointed out that the freeways would carve Cleveland Heights into segments. The proposed elevated Lee Freeway, he said, would create "a Chinese wall dividing our suburb from the north to south." He promised to join forces with Shaker Heights against both the Clark and the Lee Freeways. Cleveland Heights residents organized and attended community forums such as one entitled "Blight and Freeways" in January 1965, at which future Councilman Philmore Hart told the audience that the Clark and Lee Freeways would cost the suburb 1,000 homes. In summer 1965, Cleveland Heights City Council passed a resolution against the Lee Freeway. the issue alive and Heights citizens informed. Freeways were front-page headlines every week, and there was little pretense of journalistic objectivity when, for instance, the proposed freeway was described as a “concrete and steel monster.” In spring 1964, “Sun Press”headlines prematurely shouted that, according to a reliable source, “CLARK FREEWAY IS DEAD ISSUE.” When Rhodes finally killed the freeway, he revealed that he had been Volk’s source and gave the editor much of the credit for the freeway’s demise. Rhodes did not say why he allowed the battle to continue for another six years. Volk himself applauded the “angry, concerned citizens, acting with intelligence [who] make our democracy work. This is people power.” Volk was also a champion of racial integration and the preservation of the environment and an opponent of the war in Vietnam. The death of the Clark Freeway, however, was Volk’s most successful crusade.